I am in love with Traci Chee’s writing. If you haven’t read The Reader, you have been miss out an absolutely rich and enthralling read. The Speaker is amazingly complex, lush, and absolutely heart wrenching. What brings me back to Chee’s books are the characters. Even more so than in The Reader, the characters here are stunning. They are dynamic and retable. The alternating chapters allow us to feel their vulnerability and struggles as our own. How essential is this lingering doubt that we are not worthy? Chee appeals to our inner voices and brings us into the story as they grapple with challenges of worth, identity, and destiny. They are the same characters we love, but even better and richer than before. Reading this story feels like meeting up with old friends, if they were sorcerers and could kill us without even raising a weapon – you have those friends too right? Back again is the quintessential struggle of remembrance and immortality. Chee is a master storyteller and truly demonstrates the ways stories and names bring us to life, restore our humanity, and remind us of our lives. When our tomorrow is not guaranteed how do we live today? At the same time, Chee further explores the idea of people being turned into weapons by introducing us to more boys who were kidnapped by Impressors. What happens when we are forced to become monsters? When a part of us enjoys the killing? How do we find our way back to the ground and ourselves? There is a darkness in this story that is fascinating to unfold, while at the same time it’s balanced by a blinding light of hopefulness – even as our hearts are dashed to the rocks. Even more so, the addition of another plotline makes the entire book even more complex and multidimensional. Chee explores all of these themes – worthiness, cruel actions, and our struggle for love – in a myriad of ways that leaves us with a feeling of awe. Every single one of these characters is speaks to you in some way, whether they mirror our own inner demons or the doubts we have about ourselves. They are vulnerable and unique in their own way, carving out little parts of your heart. (This book also features a m/m relationship). The characters come alive underneath our fingertips, the conflicting desire to fight and to love, our feelings of guilt and struggle for atonement, our need for agency, and the firm refusal of fate. Does all that is written come to pass? It’s a question that has haunted books since the beginning of books – the conflict of fate and free will. How can we influence our future when it seems to exist in the book? 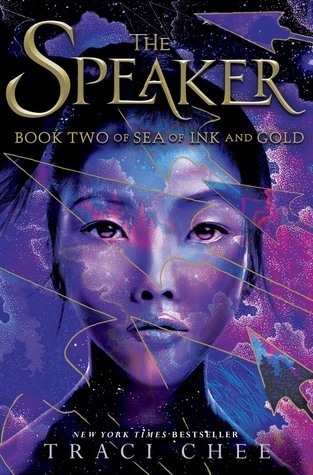 These questions and more are asked in The Speaker, the thrilling sequel to The Reader, in ways that leave open ended answers and the promise of more adventure to come. This book tugs at our delicate heart strings and filaments of longing for happy endings, sacrifice, and the power to change fate. We all want to be remember, perhaps immortalized in print, but at the same time have the open waters of the sea, the certainty of fact, and the flexibility of free will. You need The Speaker and can order it from Amazon(US), your local indie, and Goodreads. Disclaimer: I received this book in exchange for an honest review from the Publisher. What is the author you keep coming back to?